Back when we were greening our lives, I ditched plastic water bottles. At first, I had a Sigg, but the more I learned, the more I disliked their lack of transparency. They never would answer what their liner was made of, and I was not comfortable with with their answers to the tough questions. 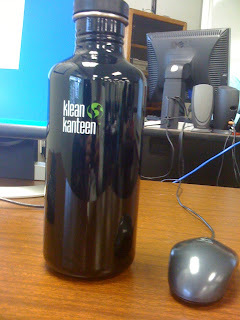 As a result, I switched over to Klean Kanteen, and I am glad I did. Not only is my Klean Kanteen wonderful, but recently Sigg outed themselves and admitted their lining contains BPA (see links on bottom for more information). Klean Kanteen is made of stainless steel and contains no liner. I'm glad to hear you like your Kleen Kanteen! I've been looking into different reusable water bottle because I'm not entirely thrilled with my current reusable one.